Effective communication is key in having and sustaining a successful business. We believe that we can improve your communication by using the latest in Business Communication Technology with VoIP, or Voice over IP. Say Hello to Allworx Verge! One of the most cost effective ways to improve your business’ communication technology is to replace your existing business phone system with a VoIP phone system. As traditional workspaces become a thing of the past, Voice over IP allows businesses to combine their data and voice networks while getting advanced telephony features without the high costs associated with a traditional PBX phone system. Miken has partnered with Allworx and together we are able to deliver a vast array of VoIP products and software. Cost savings: Rather than traveling across conventional commercial telecommunications line configurations, voice traffic travels across the internet or through private data network lines, rendering long-distance calls, for example, inexpensive. Easy to install, configure and maintain: IP Phones are simple to install because rather than running phone wiring throughout your facility, you just connect your IP Phone to your existing network connection. VoIP software makes it simple and inexpensive to add new users, as well as move, add, or change the system’s configuration. It’s scalable: Are you able to predict how many phones you’ll need over the next year? It can be difficult to predict, and if you have a traditional phone line, you have to estimate carefully to avoid spending money on phone lines you won’t use. With VoIP your business can add a line as soon as you add a new employee, and when an employee leaves, you can easily remove the line or reassign it to the new hire. It’s that simple. Mobility: Planning on rearranging or expanding your office? With a convenient web portal, users can access and reconfigure the system at any time. VoIP is also great for employees who travel a lot or are out in the field all day. Calls can be diverted to anywhere using the hosted VoIP phone system features. Integration: Since VoIP is using the internet to place calls, VoIP systems can integrate easily into business applications you use on a daily basis. You can do things like place outbound calls through Outlook or bring up a customer record with that customer’s outbound calls. Voice mail is also accessible via email for works out in the field. 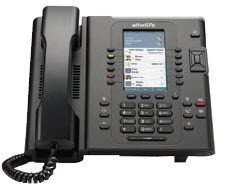 Interested in learning more how an Allworx Voice over IP phone system can work for your business? Contact Miken today by filling out our contact form!